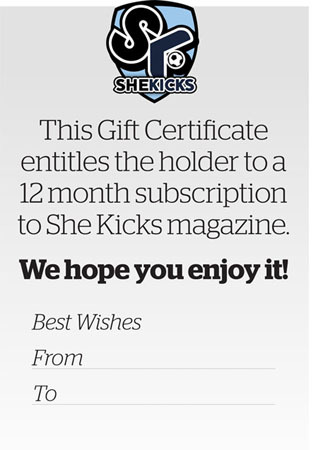 Buy someone an Annual subscription to She Kicks bi-monthly magazine as a present for their Birthday or any other Special Occasion (or just because you like them!). In addition to copies of She Kicks, each recipient of a Gift Certificate will also receive a free copy of the She Kicks 2018 calendar (which will be available from mid-December 2017 and this will be despatched separately when available, if gift is ordered before then). At checkout, please enter the delivery details of who you would like the copies of the magazine to be sent to. After buying, you will be provide with a link to a form that you can complete and submit, to let us know who to send the certificate to and, if you want to us to print on the certificate who the gift is From and To. The cost of £22 includes UK postage for all issues during the period covered by the Annual subscription (additional postage applies for overseas deliveries. This will be charged at checkout). Any questions or problems please email shop@shekicks.net or telephone 0191 442 1001.